Charles Pryor died a long way from home. He is buried in the Kut War Cemetery in Iraq having died of his wounds on 22nd December 1915. Home was a five room house at 13 Bojewyan Stennack, Pendeen where he lived with his parents Charles and Annie and his sister Mary and her son William. His brother-in-law, William Henry Matthews, was a Royal Marine based at Devonport. The Pryors were not native Pendeen people, Charles senior was born in Deptford and had followed a career in the Royal Navy until becoming a coastguard. His wife Annie had been born in Abercorn (Linlithgow) in Scotland and their daughter Mary was born in Queensferry, also Linlithgow. Charles junior was born in Swanage in 1889 and his father is shown on the 1891 census as a boatman with the coastguard service. By 1911 both Charles and his father were employed in mining. Charles senior was a stationary engine driver at Levant and his son was an underground worker. The Levant wages books shows that Charles Pryor senior worked at Levant throughout WW1 and he is shown as being a member of the submarine party. Since he is elsewhere described as a stationary engine driver it's probably reasonable to assume that he was part of the crew who looked after the engines which serviced the two submarine shafts. The same wages book shows young Charles working in the deep levels of Levant, he is a tut worker on development work driving the 326 west of New Submarine Shaft. In other words he is about 2000 feet below sea level over half a mile out out under the Atlantic Ocean. Out under the Atlantic in the 326 was the hottest area of the mine and was known as Little Hell. A four hour trip down here in 1990 saw a Trevithick Society member lose half a stone in weight and the mine would almost certainly have been hotter when working back in 1914. But Little Hell was probably nothing compared to what was awaiting young Mr Pryor following enlistment. He'd left Levant by July 1915 and become soldier number 3118 in the 2/6th Battalion of the Devonshire Regiment, a territorial force of men who had joined up after the declaration of war. The 1911 census suggests that he had previous military experience with the 4th D.C.L.I – Duke of Cornwall's Light Infantry – so it's possible that when he enlisted he was more or less immediately given the rank of sergeant. As his military records have not survived it's difficult to be certain about anything until he meets his untimely end at Kut-al-Amara in Mesopotamia. In January 1915 the 2/6th Devons were posted to Bombay and at some point between then and November 1915 Charlie, as he was almost certainly known, was attached to the 2nd Queen's Own (Royal West Kent Regiment). Two companies were then attached to the 6th (Poona) Division in November 1915 and became besieged at Kut-al-Amara. Charlie Pryor must have been in one of the two attached companies. Following the Battle of Ctesiphon (22-24 November 1915) the British advance on Baghdad came to an abrupt end and the Poona Division retreated back down the Tigris River towards Kut where they arrived on 3rd December. Surrounded by a Turkish army of increasing size they were then put under siege until Major General Townsend surrendered on 29th April 1916. The surrender has been called the most abject capitulation in Britain's military history and it resulted in in the deaths of 70% of the English POWs and 60% of the Indian POWs of the 13,000 men who were handed over to the Turks by Townsend. (Just to be absolutely clear about this most of the POWs were British or Indian) Townsend himself spent the rest of war in luxury on the island of Heybeliada in the Sea of Marmara. 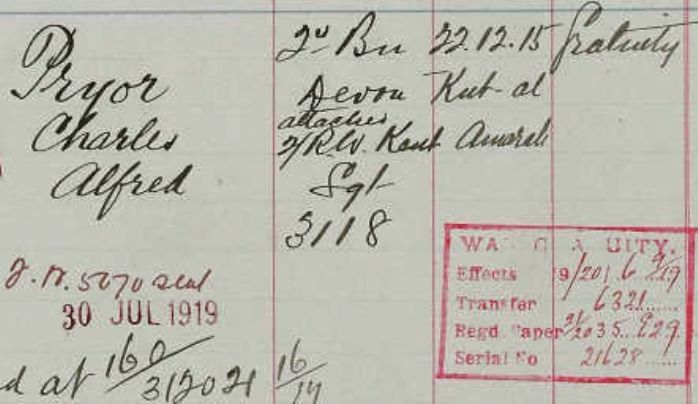 Charlie Pryor died early in the siege, the medal role records indicate that he died of his wounds on 22nd December 1915 at Kut-al-Amara while attached to the 2nd Royal West Kents from the 2nd Devons. We have no information as to the nature of his wounds or where and when they were sustained. The records also give 28th August 1915 as the date of his disembarkation, presumably in Mesopotamia, which would give him an active battlefield service of 117 days, almost 4 months. Remarkably, Charlie's parents published an acknowledgement notice dated 10 January 1916, barely three weeks after his death, thanking their friends for expressions of sympathy. Sergeant Charles Alfred Pryor was 25 years old when he died, he was buried in the War Cemetery at Kut in Mesopotamia, now Iraq. With him in Iraq lie fellow Pendeen boys William Brooking, Noah Harvey and Richard Warren. There is no silver lining to this story. Charlie Pryor died in an ill-conceived and badly executed campaign which resulted in a human catastrophe as the survivors of Kut were marched off to captivity. Historian Geoffrey Elton was present at Kut as a junior officer and saw the men being marched away, none of them fit to march five miles ... full of dysentery, beri-beri, scurvy, malaria and enteritis; they had no doctors, no medical stores and no transport; the hot weather, just beginning……. Levant: A Champion Cornish Mine, John Corin, edited and expanded by Peter Joseph, Trevithick Society, 2013. The quote on the capitulation at Kut is from Jan Morris, Farewell the Trumpets, Faber and Faber, 2010. The closing quote from Geoffrey Elton is taken from The Guardian 20 November 2002: The Tragedy of Kut by Ross Davies. The bulk of this article was compiled as part of the Levant Trench Project, July 1916.